Cook and drain manicotti as directed on package using minimum cooking time (cooking for the minimum time helps prevent the shells from tearing while filling). Meanwhile, in 10-inch skillet, cook beef, onion and garlic over medium heat 8 to 10 minutes, stirring occasionally, until beef is brown; drain. Stir in pasta sauce. Heat oven to 350°F. Spray 13x9-inch glass baking dish with cooking spray. Squeeze thawed spinach to drain; spread on paper towels and pat dry. In medium bowl, mix spinach, cottage cheese, mushrooms, 1/3 cup Parmesan cheese, the nutmeg and pepper. In baking dish, spread 1 cup of the beef mixture. 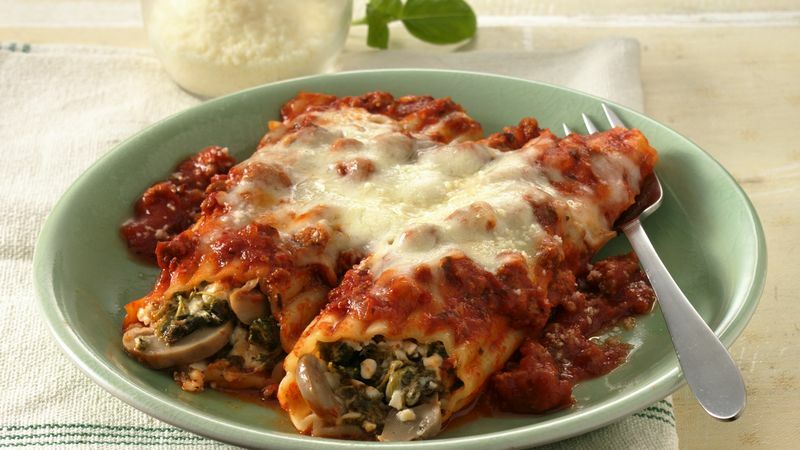 Fill manicotti shells with spinach mixture. Place shells on beef mixture in dish. Pour remaining beef mixture evenly over shells, covering shells completely. Sprinkle with mozzarella cheese and 2 tablespoons Parmesan cheese. Cover and bake 30 minutes. Uncover and bake 20 to 25 minutes longer or until hot and bubbly.